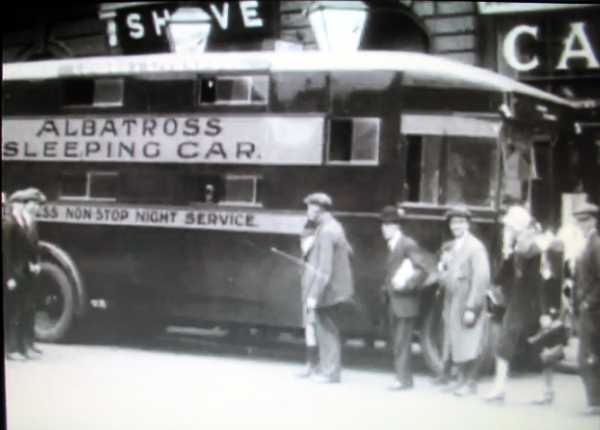 With Stagecoach Megabus trialling bendybuses in advance of starting sleeper services on the London-Glasgow route, here is a newspaper photo of a 1929 sleeper bus working the last time such services operated. Does anyone have any information on these services? And does anyone know what make of vehicle this is? The radiator does bear some resemblance to a contemporary Guy. Definitely a Guy FCX. The book "80 Years of Guy Motors" by Robin Hannay and Stuart Broatch tells us that, in 1928, a firm called Land Liners Ltd inaugurated a service between Liverpool/Manchester and London using two such vehicles, which had bodywork by Strachan & Brown. How long this service lasted is not stated, but the Guy six wheelers were not noted for reliability (though they were less lethal than their Karrier market competitors) and the roads of the time were not really suitable for such ventures. This is definitely a Guy double-deck coach. A photo of the front off-side appears in the book "Guy Buses in Camera" (Robin Hannay). It also has a mention in Robin Hannay's later book "80 Years of Guy Motors Ltd". To sum up what is written in both books, there were in fact two such vehicles. They were new in 1928 or 1929 (the text of each book differs here!). Land Liners Ltd began a service between Liverpool/Manchester and London with these. The bodywork was by Strachan and Brown (still in London - Acton? - at that date)and seated just 31 passengers. Toilet and Refreshment facilities were provided. Neither book mentions the time taken to travel between these destinations, only that such a service was ahead of it's time pre-1959 motorways. The Guy chassis is model FCX, which came with either 18ft 6ins or 19ft 1.1/2ins wheelbase. The book details don't say which option applied to these vehicles. My own observations would be that the service may well have ended at the onset of the 1930 Road Traffic Act, which sorted out the sheep from the goats for many operators. It would be interesting to know if anyone else knows better. Hopes must have been high, though, for it was in the same period (1928) that the famous Black and White Motorways services were established and developed from Cheltenham. Perhaps the choice of vehicle was a factor, as six-wheelers of this era were notoriously short-lived (Karriers especially, Guys were generally better). I wonder what happened to these vehicles eventually - when they were withdrawn; were they sold on as PSV's, or rebuilt as normal stage service PSVs?The other comment is the body work style. A full-front was very rare at this stage of bus development (for double-deckers). The trend developed later in in the 1930's (several were demonstrated at the 1935 Motor Show). The very smooth sloping profile and upper deck window style is also outstanding. It foreshadows the Metro-Cammell metal framed design of 1935 onwards. At 1928/29, the Leyland "piano front" body on the TD1 was still seen as revolutionary, and was only just being overtaken by Rackham's styling for the contemporary AEC Regent. In the "Guys in Camera" book, the nearby pictures display another Guy FCX, with a very square body on which the upper deck does not project over the driver's cab (A Northampton vehicle). Also on that page is an open-top, open staircase Guy BTX trolleybus (Hastings). The contrasts could not be greater. The same picture appears in Bus & Coach for May 1929. Details are sketchy but it's captioned as "The latest in sleepers - a double decker body by Strachans on a Guy six-wheeler chassis. The overall height is 13 ft 9 in." An accompanying news piece records "Then we have had a most imposing sleeper coach body from Strachans factory. It is a very original design and makes a great step forward in that it provides sleeping accommodation for twenty-one, or alternative sitting accommodation for forty-four passengers. There are two- and four-berth cabins and a wonderfully complete kitchen and attendant's compartment. Features of the construction are the two-deck layout, and the fact that the main framework is a light skeleton of angle iron and ash, thus rendering body sides only one inch thick - the interior width is in fact 7ft 3in." There's unfortunately no mention of the operator or timetable detail. Express sleeper coach services were in vogue at the time - but it didn't last! Will Stagecoach's? 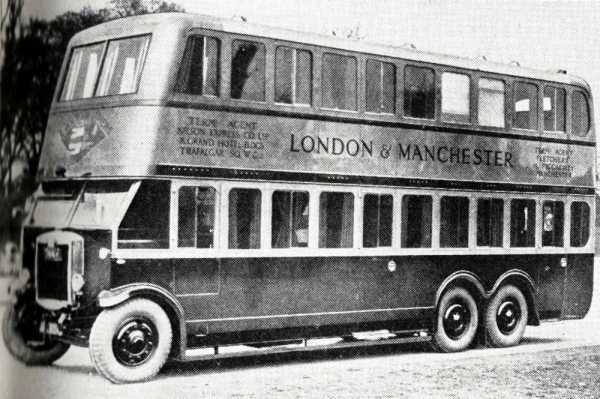 In the OS publication "Motor Coach Services from Merseyside 1920-1940 Pt1", Bruce Maund recorded in 1980 - "An enormous six wheel Guy double decker was commissioned by Land Liners Ltd. for operation between Manchester and London. It had a capacity of 44 by day and 21 by night but it is believed that it never entered service as it was too heavy to comply with the regulations." I've recently uncovered another express night sleeper bus, called the Albatross Sleeper Car. This service, running 1928-1929, ran from London to Liverpool, using a Daimler chassis. It had bunks for 12, a kitchen and an Elsan chemical toilet. The Daimler (CH?) was likely to be more robust than the Guy used by Land Liners." Regarding the modern Stagecoach Sleeper an enthusiast friend of mine has just been on this service.He said it was quite nice and in any case he only paid �2-50 as he booked well in advance. I was interested to know where he was woken up and it seems an early morning call is given about half an hour before London and the same thing at Glasgow.